How many players from champions Manchester City made it into your Premier League team of 2018? We asked you to pick your Premier League team of 2018… and the results are in. Some selections were close, others less so. As of 12:00 GMT on 1 January, this is the team you selected, with a few extra details on those who narrowly missed out. Manchester United’s David de Gea edged out Liverpool counterpart Alisson. The Spaniard was selected in 35.5% of teams, while Alisson was in 30.5%. Title-winning Manchester City goalkeeper Ederson came third – featuring in 25.1% of your teams – with Everton’s Jordan Pickford fourth, Tottenham’s Hugo Lloris fifth and Chelsea’s Kepa Arrizabalaga sixth. The closest battle for a place in your team of 2018 came at right-back – Liverpool’s Trent Alexander-Arnold edging out Manchester City’s Kyle Walker by 23.8% to 23.4%. Things were much more clear-cut at centre-back. Virgil van Dijk was chosen by a massive 85% of you after an impressive first year at Liverpool. With 4-4-2 the most-used formation, the Netherlands international is paired with Manchester City’s Aymeric Laporte (21.82%), who saw off competition from Van Dijk’s Liverpool team-mate Joe Gomez, Tottenham’s Toby Alderweireld and Leicester’s Harry Maguire. At left-back, Liverpool’s Andrew Robertson was selected by 47% of you, comfortably beating Chelsea’s Marcos Alonso (12%). Manchester City’s Kevin de Bruyne was the most popular midfield pick, making it into 65.2% of teams – albeit in different positions. The majority of those picks came on the right so the Belgian takes that spot in your line-up. Chelsea’s N’Golo Kante takes the defensive role in central midfield after making it into 24.1% of teams – edging out Manchester City’s Fernandinho (20%). Alongside Kante in midfield is City playmaker David Silva, with 42.2% of you picking the Spaniard. Tottenham’s Christian Eriksen was the next most popular. On the left it’s Chelsea’s Eden Hazard, who was selected in 62.2% of teams – albeit not all in the same position. 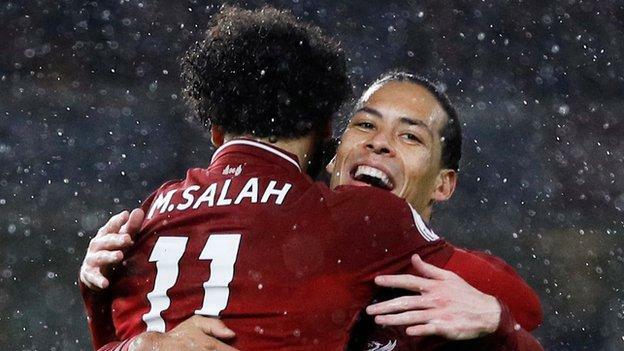 It’s perhaps no surprise who the most popular player is in your team of the year – Liverpool’s Mohamed Salah, who scored an unrivalled 28 Premier League goals in 2018, was selected by 87.63% of you. Partnering the Egyptian is Tottenham’s Harry Kane. The England captain was picked in 54.75% of your teams, having scored 25 goals in the calendar year. Arsenal forward Pierre-Emerick Aubameyang was the next most popular striker (30.67%), followed by Sergio Aguero with 21.04%. So that’s BBC Sport users’ team of 2018. If you still haven’t selected your XI you can still do so using the tool below.